We all have favorite food smells that trigger memories. Some are good, some are bad... and some are just ones we've grown accustomed to as the norm. One of my favorite smells in the whole world is of onions and garlic sauteing in oil. This is how my mom starts about 95% of the savory ethnic dishes she made. I knew the minute I heard the sizzle of the wok when the onions and garlic hit the oil, it was only a matter of time before we would be sitting down around the table to eat. As I got older, I had the task of preparing the onions and garlic for the day's meals. Then before I knew it, it was my task to plan and cook dishes for the family while my parents were working. I still think about the progression of how I got comfortable in the kitchen as I cook and bake today... and the smells of onions and garlic sauteing take me back every single time. 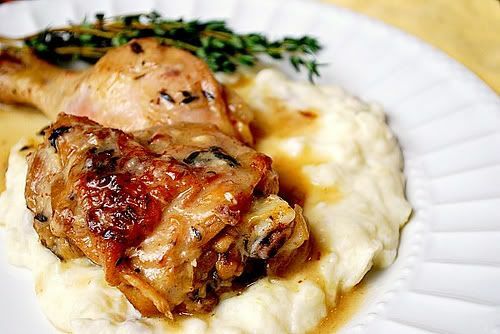 This 40 Clove of Garlic Chicken recipe is a Ina Garten favorite of many readers and I've seen this dish floating around among food blogs I follow. With 40 cloves of garlic in the dish, I knew this was a recipe I'd enjoy. With 40 cloves of garlic sizzling in a little extra virgin olive oil and a touch of butter, I was in heaven! Here is my last 'Ina Garten' recipe I made this week based on our readers' suggestions last week. What better way to end the work week with something comforting and flavorful! When preparing this recipe, I used chicken quarters and chopped them into legs/thighs instead of the original whole chickens called for in Ina's recipe. This made it easier to cook in the Instant Pot, which makes the chicken even more tender and juicy. The only other substitution I made from the original recipe was using bourbon instead of Cognac, which gave a little sweetness. I loved how the dish came out and the whole pieces of garlic just melted into the sauce. If you love garlic, this is a recipe you cannot pass up! To pair with this dish, you can serve it with your favorite starchy side such as rice, pasta, potatoes, etc. I was in the mood for something comforting so I made a creamy, fluffy cloud of goat cheese mashed potatoes - recipe follows. Dry the chicken with paper towels. Season liberally with salt and pepper on both sides. Press SAUTE on the IP and add oil and butter; heat until shimmering. In batches, saute the chicken in the fat, skin side down first, until nicely browned, about 2-4 minutes on each side. Turn with tongs or a spatula; you don't want to pierce the skin with a fork. When a batch is done, transfer it to a plate and continue to saute all the chicken in batches. In the now empty IP, add all of the garlic to the pot and saute for 5 to 10 minutes, turning often, until evenly browned. Add 2 tablespoons of the bourbon and the wine, return to a boil, and scrape the brown bits from the bottom of the pan. Return the chicken to the IP with the juices and sprinkle with the thyme leaves. Press MANUAL and adjust the time to 20 minutes on HIGH pressure. Once at pressure, the display will reflect 20 (the number of minutes you initially set) and will begin to countdown to 0 minutes. When the IP beeps after pressure cooking for 20 minutes, allow your IP to naturally release pressure for 10 minutes. While naturally releasing pressure (also known as NPR or NR), the display will reflect numbers counting up from 1. The numbers indicate how many minutes the IP has stopped cooking since it beeped (or how many minutes it has been naturally releasing pressure). No need to touch your IP while it naturally releases pressure. When the display reflects L10:00 (which is 10 minutes since the IP has beeped), turn the setting on top of your IP to VENTING. Doing so allows the IP to quickly release any remaining pressure (also known as QPR or QR). I use a wooden spoon to carefully turn the setting to avoid close contact with the potential steam. You may also want to turn your IP away from cabinets to allow the released steam to escape freely. The pin at the top of your IP will drop when all pressure has been released and it's safe to open. The IP will automatically default to the WARM setting. Remove the chicken and transfer to a platter; cover with aluminum foil to keep warm. Add 1/2 of the sauce from the pot into a 2-cup measuring cup. Whisk in flour and then transfer mixture back into the IP. Press SAUTE and allow sauce to come to a boil. Add the remaining tablespoon of bourbon and the cream to the pot, and boil for 3 minutes. Add salt and pepper, to taste. Pour the sauce and the garlic over the chicken and serve hot. To serve, plate chicken and pour sauce with garlic around chicken. Enjoy with your favorite side dish or try it with Goat Cheese Mashed Potatoes, recipe below! In a saucepan, place your clean potatoes and cover with water. Boil over medium high heat until the potatoes are fork tender. Drain and return back to saucepan. Add the butter and warmed milk to the saucepan and mash the potatoes (skin on) with a masher until your desired consistency. The potatoes will look a little runny. Crumble the goat cheese into the saucepan and stir until it melts into the potatoes. The potatoes will have more body and won't be as runny once the goat cheese is incorporated back in. Season with salt & white pepper to taste, if desired. Plate and serve the Chicken with 40 Cloves of Garlic on top. This sounds delicious! The breakdown on how to make this in the IP is excellent for a beginner like myself. Thank you. So after you cook the chicken in the sauce and take out the chicken. You take out 2 cups of the liquid to make the gravy. Add flour, then did you throw out the rest of the liquid in the pot and only put the 2cups with the flour back in the pot? Is that correct? Pour the sauce and the garlic over the chicken and serve hot. Essentially, you take out SOME of the liquid from the pot to create a starter for the gravy and return it back to the pot to thicken. No liquid from the pot is discarded, thrown out or unused. You will need all the liquid to make the gravy.